We’d love your help. Let us know what’s wrong with this preview of Glaciers by Alexis M. Smith. Isabel is a single, twentysomething thrift-store shopper and collector of remnants, things cast off or left behind by others. Glaciers follows Isabel through a day in her life in which work with damaged books in the basement of a library, unrequited love for the former soldier who fixes her computer, and dreams of the perfect vintage dress move over a backdrop of deteriora Isabel is a single, twentysomething thrift-store shopper and collector of remnants, things cast off or left behind by others. Glaciers follows Isabel through a day in her life in which work with damaged books in the basement of a library, unrequited love for the former soldier who fixes her computer, and dreams of the perfect vintage dress move over a backdrop of deteriorating urban architecture and the imminent loss of the glaciers she knew as a young girl in Alaska. To ask other readers questions about Glaciers, please sign up. 1. It is a love story centered on library employees. 2. It is set in a place where I've lived (Portland, OR). 3. It has a bearded man (a decent one). 4. It contains the mention of postcards and love letters. "He kisses her neck and his beard leaves thousands of tiny abrasions on her neck." Yep, that is actually in this book. Smith knew how to make the most of the scant pages she had. A quiet little book full of reflections with such pretty passages, it felt so comforting and perfectly narrated by Rebecca Lowman, a perfect accompaniment. Would that I could give this negative stars! I made the mistake of reading the author's bio before starting the book. Had I not, I might have been able to give her the benefit of the doubt and overlooked (but only momentarily, because they're really hard to miss) the gratuitous stereotypes strewn throughout the first few pages--the protagonist waking up in a small attic apartment in Portland and loving on her cat as she thinks about what vintage options her closet will spew onto her before going Would that I could give this negative stars! I made the mistake of reading the author's bio before starting the book. Had I not, I might have been able to give her the benefit of the doubt and overlooked (but only momentarily, because they're really hard to miss) the gratuitous stereotypes strewn throughout the first few pages--the protagonist waking up in a small attic apartment in Portland and loving on her cat as she thinks about what vintage options her closet will spew onto her before going to work at a library. Isabel, the protagonist, is a mousy hipster who barely says anything throughout the book, yet we're supposed to both empathize with her humanity as a character and believe that Spoke, slightly less of a wet blanket and the object of her affections, has come to feel anything besides utter apathy towards her (I certainly can't find anything worth loving in her). Have you ever been at a loss for words, and find yourself mindlessly humming a tune that seems to encapsulate every ounce of your sentiments? After finishing this book in one sitting, the only tune that comes to mind is Billy Joel's "She's Got a Way." In a stream of consciousness narrative style, Smith takes us through a day in the life of Isabel, a singleton living in Portland, who repairs damage Have you ever been at a loss for words, and find yourself mindlessly humming a tune that seems to encapsulate every ounce of your sentiments? After finishing this book in one sitting, the only tune that comes to mind is Billy Joel's "She's Got a Way." In a stream of consciousness narrative style, Smith takes us through a day in the life of Isabel, a singleton living in Portland, who repairs damaged books in the basement of a library. Living a quiet, predictable life, her longing is channeled into her love of thrift stores, vintage clothing, and personal ephemera. Cycling between present day, and her childhood on a homestead in Alaska, Smith uses sparse, beautiful language to convey Isabel's needs and fears. Something about this novel's quiet subtleness put me in mind of the film Lars and the Real Girl. You either get it or you don't. "All these things tell a story, but is it hers? It has always been more than an aesthetic choice, holding on to the past; it’s a kind of mourning for the things that do not last. We do not last, she thinks. In the end, only the stories survive." Years ago, when I was living in another apartment complex, somebody left a small box of books in the laundry room. Most were Harlequin Romance type things--not my cup of whiskey--but there was a yearbook from Fort McClellan, Alabama. It was from the mid-1950's, and it traced a group of young women through Army basic training. While my clothes washed, I paged through the official portraits, those serious, dress uniform studio shots you see when someone gets killed. I saw more candid photos as wel Years ago, when I was living in another apartment complex, somebody left a small box of books in the laundry room. Most were Harlequin Romance type things--not my cup of whiskey--but there was a yearbook from Fort McClellan, Alabama. It was from the mid-1950's, and it traced a group of young women through Army basic training. While my clothes washed, I paged through the official portraits, those serious, dress uniform studio shots you see when someone gets killed. I saw more candid photos as well, as these women took classes; practiced on the rifle range, and beat the crap out of one another with pugil sticks, or in hand-to-hand combat. This book showed facts and photographs. My laundry done, I took the book back to my apartment, and read through it for an hour or two. It was a black and white document of Eisenhower-era basic training. As I looked at their faces, staring at them, trying to get a read on each of these young women, I was able to follow some from picture to picture--I could pick out those who were genuinely happy, as those who would rather go back to Racine and kick her recruiter square in the nuts. Most of all, of course, I was trying to figure out which of my older female neighbors had served in the U.S. Army. Isabel in "Glaciers" has the same kind of mind. As a young girl, she visits thrift stores and antique shops, looking for postcards of European cities. Between Alaska and the Pacific Northwest, Isabel hungers to visit great cities abroad--especially Amsterdam. She doesn't get to travel, so she collects vintage postcards, and travels vicariously through them--even better, when she stumbles upon a used postcard. For hours, she pored over a treasured postcard from Amsterdam, wondering why M would go to Amsterdam without his beloved L (M has to be a man, she observes, because of the handwriting). Isabel's teacups are mismatched, one each of many different styles and qualities. This is on purpose. She saw these individual cups and saucers in thrift shops, and wondered what happened to her cups' proteges. After all, no bride would be happy receiving one cup and one saucer. "Glaciers" shimmers, with rich attention to background, as well as a wonderfully keen eye for humans and our customs--almost a detached, anthropological take at times, like Isabel's spot-on description of so many of us today: the kind of loose-minded travelers who pointed and photographed without really seeing. That always fascinates me: I see people in parks, at fireworks displays, at concerts or their kids' ballgames, and they either have their eye glued to a video camera, or an infernal smartphone, the result being that they completely miss experiencing the event they wanted to preserve. Seriously, Is there anything ironically less impressive than a home video of fireworks? In person--where the explosions, colors, and sparkles fill the sky, and the booms and hisses and whistles make you jump a little despite yourself--fireworks are amazing. On tv or YouTube? I have more impressive screensavers. "Glaciers" switches back and forth through various stages in Isabel's life, though the narrative is mainly from the present: Isabel has a great job--she's 32 years old, with her own apartment, plenty of old things she's bought, and with a crush on Spoke, a nerdy-cute Army vet who works in her office. We see how Isabel's fascination with old things began as a curiosity, then became--in lean times as her parents divorced--a necessity. Now, as an ostensible grown-up, when Isabel has a party to attend, and she wants the perfect dress to impress her crush, her first stop is a thrift store, not a fancy boutique. Mellifluous prose there, and "Glaciers" writ large just shimmers. "Glaciers" is not a long book--178 pages--and considering the richness of the prose, it never bogs down. So many books these days give us banal pencil sketches of their characters, that when Isabel notices the tiny, real things that differentiate us from one another, it's almost stunning to find a character so well drawn. Alexis M. Smith writes wonderfully, weaving Isabel's story like a tapestry in which every string is crucial. Her command of descriptive language reminded me of Joyce Carol Oates or Thomas Wolfe, and I hope she has a long career, and a limitless supply of good ideas. Although there is probably no less-meaningful distinction on Earth, "Glaciers" is on the short list for my favorite book of 2012. I can see myself reading it over and over, taking comfort in it as a sort of touchstone in this world, one where I know I'm not the only one who'd be fascinated by that Army Basic Training yearbook. 174 pages of breathtaking wow. This is a book about discarded photos, maps, and postcards, and how the people in the photos and postcards remind us that old people were once young, and we will one day be old. Its beautiful clarity suggests that relationships have changed, but in important ways, they have stayed the same. Everyone should read this book, I am ever so glad I did. Looooved this small book. Packs a punch despite its brevity. A fun book to hold in your hands, I recommend the print version over an ebook for this one. I discovered ‘Glaciers’ by Alexis Smith through a friend's review of it. Something about the book and the description of the Tin House edition made me want to read the book. I finished reading it yesterday. Here is what I think. ‘Glaciers’ follows one day in the life of Isabel. Isabel lives in Portland, Oregon. She works in a library and repairs old books. She lives a quiet, contented life. 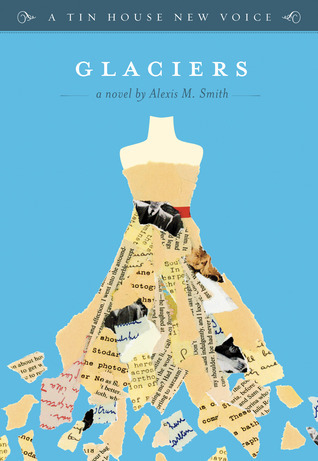 She takes pleasure in the small, simple things – shopping for a nice secondhand dress which is atleast a fe I discovered ‘Glaciers’ by Alexis Smith through a friend's review of it. Something about the book and the description of the Tin House edition made me want to read the book. I finished reading it yesterday. Here is what I think. This book has a very dreamy quality about it and as it covers one day (with flashbacked memories interwoven) of Isabel's life, it's pace is like a stroll rather than a race. And it's quiet. As someone who is reading a lot on kindle of late, I actually bought this in book-form because of its satisfying size (smaller than most novels). The print is elegant, the paper is high quality and deckle-edged, and I adore how the margins on each page are pretty wide. It's just a visually and texturally satis This book has a very dreamy quality about it and as it covers one day (with flashbacked memories interwoven) of Isabel's life, it's pace is like a stroll rather than a race. And it's quiet. As someone who is reading a lot on kindle of late, I actually bought this in book-form because of its satisfying size (smaller than most novels). The print is elegant, the paper is high quality and deckle-edged, and I adore how the margins on each page are pretty wide. It's just a visually and texturally satisfying little book to hold. The story is ok (read any of the synopsi available). The writing is very good, lots of lovely imagery and a few illuminating insights. I tend to bristle at any representation of the military in any media, being the wife of a retired Marine I'm a little sensitive to innacurate portrayals (hint: almost nobody gets it right), but I found this author's take to at least be fair. On a sentence level, Alexis Smith is a decent writer. Unfortunately, those sentences are strung together in a completely irritating, self-indulgent, and anger-inducing manner. The biggest problem, for me, is Smith's aversion to any sort of tension or ambiguity. She literally mentions something quasi-mysterious about Isabel (the protagonist) and explains the backstory of that quirk or attribute in the very next section or passage! I found myself wanting to yell, "It's okay to let the reader specu On a sentence level, Alexis Smith is a decent writer. Unfortunately, those sentences are strung together in a completely irritating, self-indulgent, and anger-inducing manner. The biggest problem, for me, is Smith's aversion to any sort of tension or ambiguity. She literally mentions something quasi-mysterious about Isabel (the protagonist) and explains the backstory of that quirk or attribute in the very next section or passage! I found myself wanting to yell, "It's okay to let the reader speculate! You don't need to spell everything out for us in an extremely patronizing way!" So, yeah, I felt completely useless while reading Glaciers. There's just no participatory space for the reader. This is a short novel of a twenty-something hipster librarian in Portland who likes a coworker, eats vegetarian, shops at secondhand stores, has artsy gay friends, day dreams about Amsterdam (a city where she's never been) and reminisces about Alaska where she lived as a young girl. If you were to judge this book by its cover, you would see a dress on the front and assume that this was a girly book. If you did, you would be absolutely correct. I picked this book up from the library upon seeing i This is a short novel of a twenty-something hipster librarian in Portland who likes a coworker, eats vegetarian, shops at secondhand stores, has artsy gay friends, day dreams about Amsterdam (a city where she's never been) and reminisces about Alaska where she lived as a young girl. If you were to judge this book by its cover, you would see a dress on the front and assume that this was a girly book. If you did, you would be absolutely correct. I picked this book up from the library upon seeing it on the NPR 'Summer Reads Handpicked by Indie booksellers list' where it compared this novel to Paul Harding's Tinkers. While this is a book about a twenty something love sick lady and Harding's novel is about a dying man, there is a stylistic similarity. Both books juxtapose the past with the present, switching between the two. Both authors have something against quotation marks to designate dialogue. Harding's book is less linear and the better book but this one is well written and interesting for a short novel. This is such a small, simple story, barely a story at all, and yet it leaves behind such an impression. Beautifully and quietly. Isabel was in her early twenties. She had grown up in Alaska, but life had brought her to Portland, Oregon. She lived alone and she worked in a room in the library basement, repairing old and damaged books. When she wasn’t working, she sought out dresses in vintage clothing stores, and vintage postcards in junk shops. She wondered about the places they showed, the people This is such a small, simple story, barely a story at all, and yet it leaves behind such an impression. Beautifully and quietly. When she wasn’t working, she sought out dresses in vintage clothing stores, and vintage postcards in junk shops. She wondered about the places they showed, the people who had written them, the lost stories behind them. And she dreamed of so many possibilities that they suggested life might offer. She found the name of a childhood friend inside one of the library books sent to her to be restored. He had been lost to her, so many things had been lost, when her parents separated and left Alaska for new lives. At the library, Isabel worked alongside Spoke, a veteran of the war in Iraq (so named because a bomb exploded when he was repairing a bicycle and a spoke from the wheel pierced his right lung), who was as solitary and introspective as she was. They had slowly become friends, but Isabel was sure that they were kindred spirits, that they could be something more to each other. Neighbours invite Isabel to a party. She looks for the perfect dress, and she finds it; it really is perfect. and maybe, quite imperceptibly, that created the spark that changed things. The narrative moves slowly, weaving together memories of the past; dreams of what might have been and what might be; and scenes from the life that Isabel is living. It is written quite beautifully, in spare, delicate prose, and in a lovely style that suits its subjects and its themes perfectly. It speaks profoundly of nostalgia for childhood days and times when life was simpler; of imagining other lives and other possibilities; and of finding a place in the word; of how all those things can have such a pull on a heart. I can’t say that Glaciers is a book for everyone, but it is a book for everyone who understands the appeal of vintage clothes, old postcards, classic books, and who understands how lovely it is to dream. It’s a very small book, but sometimes a small book can touch you in a way that a big book can’t. There's really not much I can say about the plot of this book, as it's pretty much exactly what the dust jacket states: a day in the life of Isabel. So I'll talk more about my overall impressions of this very slim work, if that's OK with you, dear reader. The author has a nice way with words. For example, when describing Isabel's parents' impending divorce, the author writes: "When her parents were together, they had little to say to each other. The fissures in their family grew until the most im There's really not much I can say about the plot of this book, as it's pretty much exactly what the dust jacket states: a day in the life of Isabel. So I'll talk more about my overall impressions of this very slim work, if that's OK with you, dear reader. The author has a nice way with words. For example, when describing Isabel's parents' impending divorce, the author writes: "When her parents were together, they had little to say to each other. The fissures in their family grew until the most important parts broke free and began to float away." When Isabel ruminates about her childhood dream of becoming a writer, the author tells us that her grandmother talked her out of it, saying "there was no market for being in love with words." It comes as no coincidence that our main character ends up working in preservation at a library, as it gives her a chance to save those very words that others write. There are few characters here, and none of them are what I would call overly developed. There's Spoke, the war vet that Isabel crushes on at work (his real name is Thomas, and trust me when I tell you that even I had forgotten reading it the first and only time it appears - I had to skim back over the book to find it). His nickname does involve a bicycle, albeit in a round-about way, although it was a book that almost saved his life. Isabel's older sister, Agnes, is mentioned but only in the flashbacks. Agnes is, of course, pretty and popular. Isabel describes herself as overweight, bordering on fat, but as a reader, I never really got that impression of her. Of course, many women think of themselves as "fat" when they're really just at a healthy weight, so perhaps that's the case here. My biggest reason for doubting Isabel's adult plumpness is that she shops in vintage shops, and as someone who has tried to do the same, I can't imagine her being able to buy anything is she was really that heavy. I'm not grossly obese or anything, but I have never been able to find a dress to fit me as such a shop. I see her as possibly curvy, but not fat. Sometimes you find the book, and sometimes the book finds you. This was the case for me when, earlier this year, I walked into the Barnes and Noble in Bozeman, Montana "just to get a latte" (i.e., I wasn't on a typical book-buying mission). I was walking toward the cafe when it happened: Glaciers found me. It was like one of those "meet cute" scenes in movies when the pretty brunette dogwalker and the distracted guy with the briefcase, walking in opposite directions, round a corner at the same Sometimes you find the book, and sometimes the book finds you. This was the case for me when, earlier this year, I walked into the Barnes and Noble in Bozeman, Montana "just to get a latte" (i.e., I wasn't on a typical book-buying mission). I was walking toward the cafe when it happened: Glaciers found me. It was like one of those "meet cute" scenes in movies when the pretty brunette dogwalker and the distracted guy with the briefcase, walking in opposite directions, round a corner at the same time and he ends up tangled in leashes and tails and she knocks the briefcase out of his hand, spilling papers all over the sidewalk. That's how it was for me with Alexis M. Smith's slim, pretty novel. A chance encounter. A walking past, then a double-take and a doubling-back. A glance at the cover. A skim of the plot summary, blurbs and first sentence ("Isabel often thinks of Amsterdam, though she has never been there, and probably will never go."). An eye-poke of interest. An impulse buy. It was the best thing I bought all year (and that includes the 2011 GMC Acadia my wife and I just purchased). The novel chronicles one day in the life of Isabel, a twenty-eight-year-old library worker, as she repairs damaged books, prepares for a party, and pines for a co-worker, an Iraq War veteran named "Spoke." As a single woman living in Portland, Oregon, Isabel haunts thrift stores and collects second-hand items like postcards, teacups, aprons, dresses--the cast-off remnants which were once new, happy purchases by someone decades earlier. "She feels a need to care for them that goes beyond an enduring aesthetic appreciation," Smith writes. "She loves them like adopted children." It's fitting that Isabel collects scraps of the past because she is a character who lives primarily in memory. The book slips seamlessly between the present and Isabel's childhood growing up in Alaska and Portland with her mother, father and sister Agnes. Written in sentences as simple and delicate and beautiful as a single strand of a spider's silk, Glaciers reads like a literal dream. We move through the pages quickly, as if floating just above the words, and it's over before we want it to be. I could have stayed in Isabel's world for a long, long time. This review has been hidden because it contains spoilers. To view it, click here. I liked the idea of this story more than the story itself. I liked its theme of valuing stories, honouring the power they hold. Ironically(? ), there is a thick, frosted sheet of glass over all the characters in this book and their individual stories. The effect, I think, was partly created by the dialogue choice: it's entirely made up of a distancing stream-of-consciousness summary style. The other narrative technique of short descriptions of Isobel's past alternating with short descriptions of I liked the idea of this story more than the story itself. I liked its theme of valuing stories, honouring the power they hold. Ironically(? ), there is a thick, frosted sheet of glass over all the characters in this book and their individual stories. The effect, I think, was partly created by the dialogue choice: it's entirely made up of a distancing stream-of-consciousness summary style. The other narrative technique of short descriptions of Isobel's past alternating with short descriptions of her present did nothing to deepen the relationship of reader to character. It was like a big ol' boring journal of telling. The (too many) people that come in and out of Isobel's life are only offered superficially. I don't feel as if I truly got to know a single one of them, to feel for them, to care for them. They were all displayed behind that impenetrable glass wall, where I could see what they were doing but not clear enough to see what they were feeling. I especially felt distanced from Spoke, the male "love" interest. Why did he even like Isobel romantically? Why did she like him? Their encounters, although lovely and promising of a powerful connection, were unbelievably brief for any serious commitment. Also, and perhaps the biggest problem: there is no narrative tension. It's just so... mellow. So mellow, I did not care or commit. Delightful. Charming. Delicate. These are the words that first come to mind as I reflect on Glaciers. There's not much substance in these 174 pages, but I was nonetheless happy to have spent the time with them. In many of the novel's short chapters, Alexis M. Smith discusses the small things, the photos and relics Isabelle cherishes; with superb skill, Smith has crafted each chapter with the same vivid detail and want for nostalgia that these photos conjure. There are some really wonderful senten Delightful. Charming. Delicate. These are the words that first come to mind as I reflect on Glaciers. There's not much substance in these 174 pages, but I was nonetheless happy to have spent the time with them. In many of the novel's short chapters, Alexis M. Smith discusses the small things, the photos and relics Isabelle cherishes; with superb skill, Smith has crafted each chapter with the same vivid detail and want for nostalgia that these photos conjure. Glaciers is a very short and very quiet novel that meanders from past to present to dreams of the future - all in one day. Isabel, a librarian and repairer of torn and damaged books is trying to catch the eye of a co-worker while she reminisces about her childhood and the past lives of others. Isabel is drawn to thrift stores and antique stores. She finds beauty in the cast off treasures of others - ephemera, post cards, pictures, dresses, jewelry. She is a likable main character - one that I fou Glaciers is a very short and very quiet novel that meanders from past to present to dreams of the future - all in one day. Isabel, a librarian and repairer of torn and damaged books is trying to catch the eye of a co-worker while she reminisces about her childhood and the past lives of others. Isabel is drawn to thrift stores and antique stores. She finds beauty in the cast off treasures of others - ephemera, post cards, pictures, dresses, jewelry. She is a likable main character - one that I found easy to relate to. She's a bit shy but she's also fun - someone you would like to know and have as a friend. There is sadness in her life but it won't be insurmountable. Es la nostalgia viva de una ciudad que se va quedando sin verano. La historia de una chica sin prisas porque es consciente del paso del tiempo y de sus consecuencias. Y justo por eso, aunque sea contradictorio, no está dispuesta a correr. Y es que Isabel ha creado un microuniverso propio con vestidos antiguos, libros viejos, postales del pasado y un gato que camina sobre sus pertenencias. Una realidad propia carente de gravedad en la que pedirle a alguien que te importa que te cuente la versión l Es la nostalgia viva de una ciudad que se va quedando sin verano. La historia de una chica sin prisas porque es consciente del paso del tiempo y de sus consecuencias. Y justo por eso, aunque sea contradictorio, no está dispuesta a correr. Y es que Isabel ha creado un microuniverso propio con vestidos antiguos, libros viejos, postales del pasado y un gato que camina sobre sus pertenencias. Una realidad propia carente de gravedad en la que pedirle a alguien que te importa que te cuente la versión larga de su historia cobra máxima importancia. "A slick fog of a city in the winter, drenched in itself. In the spring and summer: leafy, undulating green, humming with bicycles, breeze-borne seeds whirling by like tiny white galaxies." This book is so full of hipster clichés I can't handle it. (Vintage! Librarians! Portland! Hip parties! Sadness!) Reads like a hipster high school creative writing student's dream. This novel is not about the story. It's the writing. So simple yet so profound. Feelings, thoughts, events are all captured with such exquisite beauty that all you can do is sigh! Hacer una reseña de Glaciares es tarea compleja. Tanto como las emociones que desprende en cada una de sus páginas. Páginas repletas de nostalgia, deseos, reconstrucción y pesares. Algo sencillo y CASI maravilloso. Pero, ¿por qué digo CASI maravilloso? Pues porque Alexis M. Smith divide los capítulos. El lector se encontrará con capítulos que narran el pasado de nuestra protagonista. Todos ellos narrados de forma muy onírica, delicada e íntima. Pero el lector también se encontrará con capítulos Hacer una reseña de Glaciares es tarea compleja. Tanto como las emociones que desprende en cada una de sus páginas. Páginas repletas de nostalgia, deseos, reconstrucción y pesares. Algo sencillo y CASI maravilloso. Pero, ¿por qué digo CASI maravilloso? Pues porque Alexis M. Smith divide los capítulos. El lector se encontrará con capítulos que narran el pasado de nuestra protagonista. Todos ellos narrados de forma muy onírica, delicada e íntima. Pero el lector también se encontrará con capítulos que narran el presente. Y esos capítulos del presente son los que me han chirriado y dejado un sabor agridulce hacia el final de la historia. Unfortunately, this one just didn't do anything to me. I little splash of melancholy and longing - that's it. It wasn't what I've expected it to be and I definitely wanted more. Still planning to read Smith's newest book and hope to like it more. Although, this may be the case of "it's me, not the book" too. Well, moving on. A quiet read - almost soothing in its pace - that leaves you much to digest and consider well after you've completed reading it. This novel captured me right away. Did it help that the main character is a librarian? Maybe. Isabel was born in Seattle, but her parents moved back to Alaska shortly after she was born to live in the homestead of her father's grandmother, in the country near Soldotna. This is where she spent her early years and learned about being alone, about making do with what you have, and about the meaning of treasure. Following her parents divorce, her father moved to Portland with her and her older sister, This novel captured me right away. Did it help that the main character is a librarian? Maybe. Following her parents divorce, her father moved to Portland with her and her older sister, where she soon realized she was several years behind when it came to fashion. This, perhaps, led to her love of vintage clothes. All of Isabel's background sets the scene for this novel, a single day in her life. Planning for a party she is going to in the evening. Working as a preservation and conservation librarian, in the lower level of the library, with other subspecialists. The reader gets brought into her life, her friendships, her coworker relationships, as she moves through her day. In many ways, this is an ordinary day, but it is also an extraordinary day, for many reasons. I loved Isabel, her thoughtfulness, her depth of feeling, her appreciation for small things, her imagining of others' lives. And I loved the cover of the book, how it just feels right for it. I love her love of postcards, one I share. With an earlier Indiespensable selection, I was made aware of this book through a reference in the accompanying package of goodies, which included postcards inspired by this book. Alexis M. Smith grew up in Soldotna, Alaska and Seattle, Washington. She attended Mount Holyoke College, Portland State University, and Goddard College, where she earned an MFA in Creative Writing. Her writing has appeared in Tarpaulin Sky and on Powells.com. She currently lives in Portland, Oregon with her son, two cats, and their beloved view of the St. John’s Bridge.